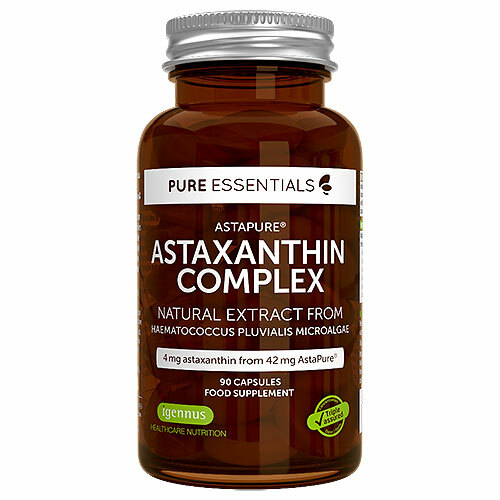 Pure Essentials AstaPure Astaxanthin Complex is a natural extract from the microalgae Haematococcus pluvialis (H. pluvialis) - the same algae responsible for the pink-red pigmentation of wild salmon and crustaceans. AstaPure contains the highest available concentration of astaxanthin, as well as a complex of other beneficial carotenoids including lutein, canthaxanthin, zeaxanthin, violaxanthin and beta-carotene. Cold-pressed extra-virgin olive oil; AstaPure from Haematococcus pluvialis (H. pluvialis) microalgae (10% astaxanthin); capsule shell (gelatine, glycerol, beta-carotene, caramel E150a). For adults and children aged 12+: take 1-2 capsules daily. For intensive support, the dose can be increased to up to 4 capsules daily. For optimal absorption, astaxanthin should be taken with fats, during or immediately after meals. 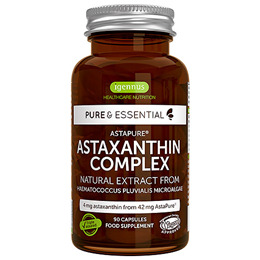 Below are reviews of Igennus Pure Essentials AstaPure Astaxanthin Complex - 90 Capsules by bodykind customers. If you have tried this product we'd love to hear what you think so please leave a review.